Throughout history, many great architects have put their own twist on the iconic eagle console table. Examples of this type of table can be found throughout Europe, including Italy and France just to name a few. This type of table was also popular during the American Neoclassical movement of the late 19th century. Today, renowned artist and designer H.J. 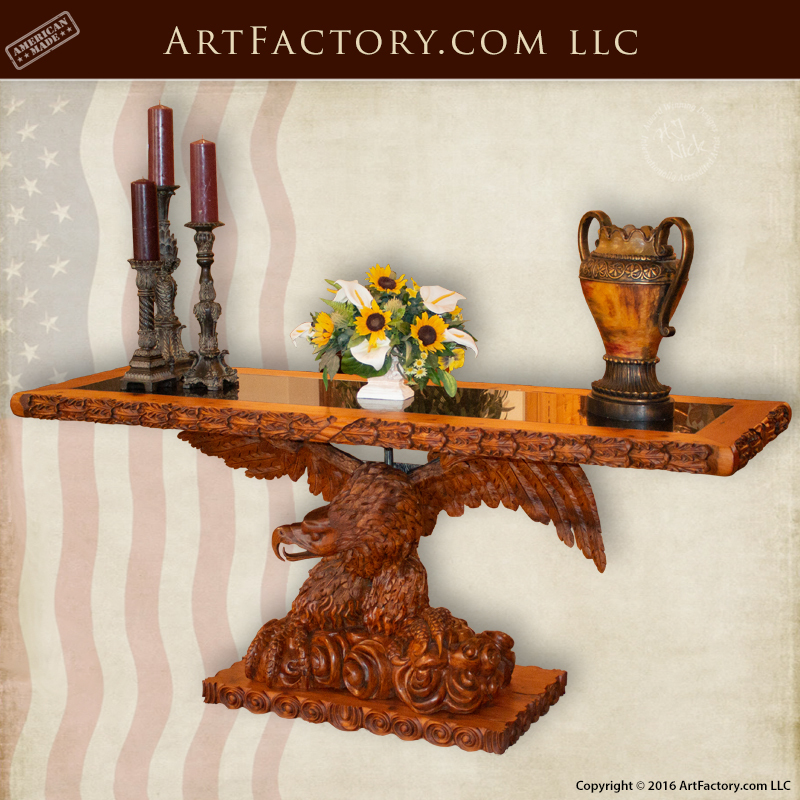 Nick of ArtFactory.com is commemorating America's economic renaissance in the 21st century has designed this eagle console table to be the finest ever made. A true world class celebration of both historically inspired arts and crafts, and America’s historic national bird. This table is an original, hand carved work of fine art. Additionally, it has been hand hewn with mortise and tenon joinery. This type of craftsmanship makes for a table that is built to stand the test of time. Finally, the table has been hand finished using a 23 step process beginning with a walnut stain & hand rubbed finish. Our multi-step finishing process gives your furnishing that enhances the natural grain of the wood, and creates a natural patina that will stand the test of time. These high relief, detailed carvings include both positive and negative levels that cannot be achieved using any CNC machine. Every feather and talon has been intricately carved by the hands of one of our fine art master carvers. The American Eagle Console Table features a black, granite inlaid, table top. At ArtFactory.com all of our stone, marble, and granite is hand cut, on site, by our expert stone masons. We import the highest quality materials from quarries worldwide to provide for a quality of table top that is unmatched anywhere. This also allows us to offer our world class quality stonework in any color of your choosing. When when it comes to stone, marble, and granite, we only deal in the genuine article, and we never use faux or manufactured stones. What this means to you is a furnishing that is built to investment quality, with future antiquity value. The table also features a solid wrought iron base, trestle, and undercarriage for structural support. This bass is hand forged by our classically trained blacksmiths using old world techniques. In other words, our wrought iron products are hand forged by master artists using fire, hammer, and anvil. Furthermore, all of our solid wrought iron is advance patinated by hand using a multi-step, heat applied process. Our fine art, iron oxide patina process makes for a finish that looks good from day one, then looks better as time goes on. Since Roman times the eagle has been used as a symbol of strength. The American, or bald eagle has represented the United States since it's first appearance on our national seal in 1782. A committee that included founding fathers Thomas Jefferson, John Adams, and Ben Franklin designed the seal. Congress adopted the seal as official in June of 1782. The eagle now appears on everything from currency, to buildings, flags, and government documents. Because of this, the bald eagle is widely considered to be an American icon. Now, you can celebrate all things America, and the arts and crafts with this unique, one-of-a-kind, American Eagle Console Table. It has been well documented over the years that Artist H. J. Nick has always been extremely proud of his French and Italian roots. The grandson of hard working immigrants, that worked proudly as contributing members of the American Dream since the mid 1840s. His family never achieved great wealth, partly due to his father being left on a church step with a note with his name. On top of that, his father's mother died at his birth in 1906. His father was fostered out, and worked as child labor in the under ground coal mines beginning at the age of 12. Later, H.J. Nick's father, as he became older volunteered for two tours in WW2. He brought his three sons up to believe in America, and that freedom was not free. He also believed that the American dream was only achieved by honest hard work and respect for others, as well as our country. H.J. Nick was fortunate to also have a strong, first generation immigrant mother, who instilled his faith in God, country, education, and the American dream. Even after his father became disabled due to a mine cave in, this spirit was still alive in H.J. Nick throughout his meager beginnings. His contribution is this company ArtFactory.com that has always been a celebration of these immigrants that were never recognized for their great contributions. This American Eagle Console Table is a part of his attempt, along with his offering of the Presidential Oval Office Desk, which he designed to remind whoever was President, that MADE IN THE USA is important to American society and its economy. The American Eagle Console Table is intended to be an offering to be a companion piece to the Presidential Oval Office Desk. Our in-house master woodworkers and blacksmiths handcraft all of our custom furniture to stand the test of time and it is guaranteed forever, call now for details 1-800-292-0008. Never settle for the rest, when you can have the best, only at ArtFactory.com.